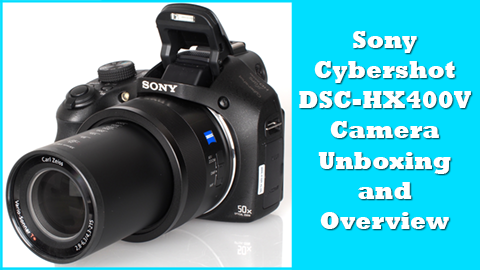 Today we are going to do Unboxing of Sony Cybershot DSC HX400V Camera, Which is a bridge camera with Mega Zoom Lens. It is top model of Sony’s 2014 bridge camera lineup, and successor of last years model Sony hx300. I have online purchased it from flipkart.com, Sony Cybershot DSC HX400V price in India is Rs. 24281. The Camera comes with free 4 GB memory card and carry case. The carry case sony branded carry case is of model MII-HD2 and its MRP is Rs. 690. The carry case comes in separate offer by flipkart, and not part of Sony’s packaging. Its not a high quality case, but can handle this camera easily. You will get 2 years manufacturer warranty which is mentioned in this box, and Warranty coupon comes inside the box. You will also get connectivity manual for your camera in the box to connect this camera with you android smartphone or iPhone/iPad wirelessly. You will get Power adapter, Power cord, USB cable to connect your camera to PC for image and video transfer, Camera Lens Cap and sony branded camera shoulder strap inside the box. This camera comes with Sony’s Lithium Ion 1240mAh NP-BX1 battery which gives you around 300 shots. The Sony Cybershot DSC HX400V Camera comes with Carl Zeiss lens. This time sony packed a Bionz X processor for fast processing. It comes with Exmor R 20.4 Megapixel sensor, 50x optical and 100x digital zoom, GPS, 3 inch LCD, Wi-Fi, NFC, Full HD Recording. Tripod mount slot is in bottom side, near battery and memory card slot. You can check More details in above Sony Cybershot DSC HX400V Camera Unboxing Video, We will soon publish Sony Cybershot DSC HX400V Camera Review, so come back soon.